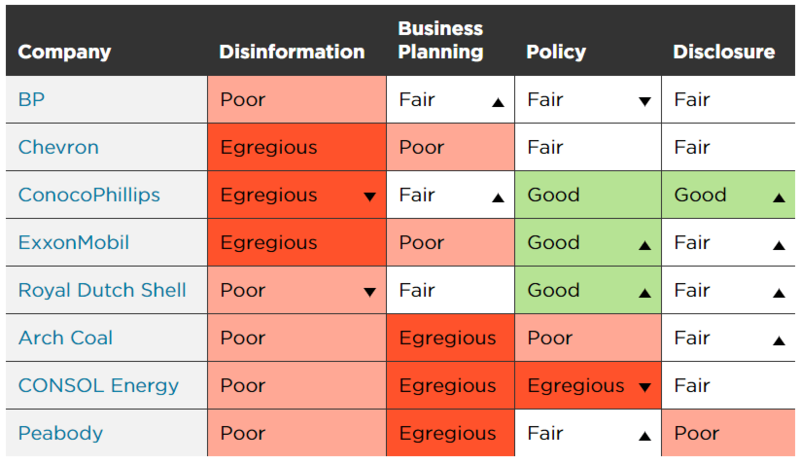 An in-depth analysis of eight major fossil fuel companies finds they continue to spread climate disinformation and have failed to adequately plan their businesses for a low-carbon world. Fossil fuel companies are facing increasing shareholder, legal and political pressure to stop spreading climate disinformation and to fix their business plans to achieve dramatic reductions in global warming emissions. While some companies are responding to this pressure, overall their efforts remain insufficient to prevent the worst impacts of climate change. In 2016, when we first analyzed the actions of 8 major oil, gas, and coal companies, we found that none had made a clean break with disinformation on climate science and policy or planned adequately for a world free from carbon pollution. In 2018, although some companies have publicly supported the Paris climate agreement to limit harmful warming, none of these companies has set company-wide emissions reduction targets consistent with this goal. Many continue to downplay or misrepresent climate science and the dangers of carbon emissions, and all continue to support trade groups that spread climate disinformation and work to stymie needed climate policies. Disinformation: Have these companies stopped spreading disinformation about climate science and policies? Business Planning: Do these companies’ business plans align with a world free from carbon pollution? Policies: Do these companies support fair and effective climate policies? Disclosure: Are these companies fully disclosing the financial and physical risks of climate change to their business operations? While every company improved its score on at least one metric and saw a score decline on one or more other metrics, there was no across-the-board improvement on any specific metric, and no single company improved in every area. Explore each company’s score per metric in the table below. Colors indicate scores. Arrows indicate changes in each company’s performance compared to the 2016 Climate Accountability Scorecard. Following engagement with Barnard College over its divestment evaluation and with UCS over our 2018 scorecard findings, BP removes from the company’s website a statement that misrepresented climate science and backslid from its 2016 position. Arch Coal, Chevron, ConocoPhillips and ExxonMobil include subtle “hedging” words on their websites and/or in SEC filings, falsely suggesting the (scientific) jury is still out on the connections between global warming gases and climate change and between the burning of fossil fuels and climate impacts such as sea level rise. Facing growing pressure from major shareholders, ExxonMobil and Chevron release climate risk disclosure reports. However, the reports lack commitments to reduce global warming emissions in line with the Paris climate agreement’s goal of keeping global temperature increase well below 2 degrees Celsius and striving to limit it to 1.5°C. BP, Chevron, and ExxonMobil fail to mention climate liability litigation explicitly in their financial filings. More than a dozen U.S. communities have filed lawsuits to hold these fossil fuel companies, and others, accountable for climate damages and preparedness. Company shareholders need to be informed about this risk to their investments. In July 2018, ExxonMobil becomes the latest oil and gas company to leave the corporate lobbying group American Legislative Exchange Council (ALEC) after successfully pressuring the group to drop a resolution against the U.S. Environmental Protection Agency’s 2009 finding that global warming gases are endangering the planet. ALEC has notoriously fought climate policies and drafted sample legislation that sought to hamper the development and use of low-carbon energy. Chevron and Peabody Energy maintain leadership positions in the group. Shareholder pressure leads ConocoPhillips in 2018 to expand its disclosures of lobbying and other public policy advocacy. Major fossil fuel companies—including those studied in this 2018 scorecard—are substantial contributors to climate change, and therefore must take responsibility for their actions. Science now makes it possible to calculate that the eight companies in this study have contributed about 14 percent of global energy-related carbon dioxide and methane emissions driving disruptive climate change. These eight leading fossil fuel companies have failed to fix their business models to reduce global warming emissions from their operations and the use of their products. At the same time, many of them have deliberately sowed public confusion about climate science and the dangers of climate change, while lobbying against needed climate policies that would help us transition to a low-carbon energy system. UCS and our experts, partners, and supporters are watching. We will continue to keep a close eye on major fossil fuel companies to assess their actions and words, recognize progress where it occurs, and turn up the heat on companies lagging behind. This week president Donald Trump signed two executive orders aimed at speeding up the development and functionality of oil and gas projects in the United States. The orders will ease the process of building new oil and gas pipelines and put up extra hurdles for state agencies that want to intervene, a move immediately decried by many state officials and environmentalists. The executive orders are intended to curtail officials’ power to limit the oil and gas sector at the state level by changing federal agencies’ issued instructions, or “guidance”. One executive order further includes a directive to curb shareholder ballot initiatives concerning environmental and social policies, while the second order, focused on border-crossing energy projects, takes the power to approve or deny pipelines and other infrastructure crossing over the country’s borders away from the Secretary of State and gives the responsibility wholly to the president. Furthermore, President Trump’s executive action also specifically directs the Department of Transportation to change its rules concerning the transport of natural gas, requiring the agency to permit the shipment of liquefied natural gas by rail and by tanker truck. This detail of Wednesday’s executive orders has already proven to be extremely divisive. The directive would open up new markets with major demand for U.S. natural gas but moving the potentially explosive substance by rail could cause potentially catastrophic accidents if one of these train cars were to derail. The initiative has other potential benefits as well, such as offsetting the steep decline of coal shipments by rail, but for many, the drawbacks far outweigh all these silver linings. You don’t need to look too far to find plenty of cautionary tales from previous experiments in sending oil and gas by rail, from spills, explosions, and accidents to a runaway oil train in Quebec that killed nearly 50 people when it derailed in a small town in 2013. The natural gas that would be shipped in train cars and tanker trucks will be chilled to 260 degrees Fahrenheit below zero (-167 Celsius) and is extremely space efficient, taking up just 1/600th of its volume in a gaseous state. This form of liquefied natural gas is already being shipped all around the world all the time, including within the U.S., where it is driven in trucks to storage facilities. In this liquefied, super-chilled state, natural gas is not flammable on its own and cannot be ignited and is actually considered much safer to ship than crude oil. While that sounds like any cause for alarm and cries of “bomb trains” is overblown, however, there is still a wide margin for risk if a tank of LNG were ruptured or caused in any other way to come into contact with air. When exposed to air, the liquefied natural gas will rapidly convert back into an ultra-flammable gas and begin to evaporate.